When I go to an art show, I'm always elated when I go to the gift shop or print area and find that my favorite artist has made greeting cards of his or her work. It's even better when one of my favorite pieces is included in the collection of cards. It's a great way for artists to sell people a little something and keep their work in the public eye. What I do is buy the card (or cards, if I have to - it's still a lot less expensive than buying a print). Then I take it home, cut the photo front from the back page if there is one (sometimes these are sold as postcards, however, so I use the whole thing). I make it look impressive by placing it on a 5" x 7" or larger piece of white or colored paper or cardboard so that a mat effect is created. Then I find a complementary color frame (dollar stores are great for this) of that size and place the whole thing under the glass. I now have beautiful little works of art I've seen in person (I may even have met the artist), framed so that they look really nice. I may not be able to afford the originals, but no one who admires them ever stops to think about that. A good cheap and cheerful option Mary. 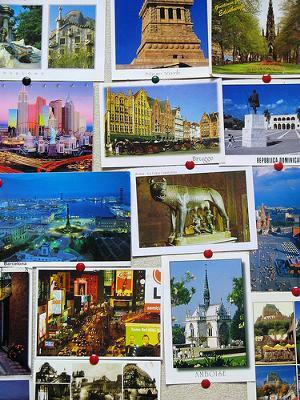 I am particularly fond of postcards whether they are framed, or even better I think, casually pinned to make a colourful notice board feature.